T. Michael Tedford, MD, received his bachelor’s degree from the University of California, San Diego, and attended medical school at the University of Cincinnati. He completed residency training at the University of Minnesota and is board certified in Otolaryngology. Dr. Tedford enjoys the full spectrum of Ear Nose and Throat practice with particular interest and expertise in sinus disease and surgery. Dr. Tedford was awarded the Bruce Linderholm Award by the Abbott Northwestern Hospital medical staff for leadership in the hospital and community. 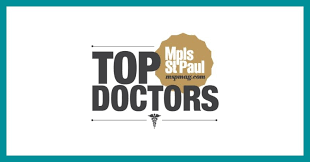 Physician and nursing colleagues have named him as a “Top Doctor” in Mpls.St.Paul Magazine and a “Best Doctor” in Minnesota Monthly. Additionally, he is an adjunct faculty member at the University of St. Thomas Opus College of Business in Minneapolis.